Visionary solutions to a community ripe for transformational change from fourteen leading innovators of Jewish life. The American Jewish community is riddled with doubts about the viability of the institutions that well served the Jewish community of the twentieth century. Synagogues, federations and Jewish membership organizations have yet to figure out how to meet the changing interests and needs of the next generation. In this challenging yet hopeful call for transformational change, Rabbi Sid Schwarz looks at the social norms that are shaping the habits and lifestyles of younger American Jews and why the next generation is so resistant to participation in the institutions of Jewish communal life as they currently exist. He sets out four guiding principles that can drive a renaissance in Jewish life and gives evidence of how, on the margins of the Jewish community, those principles are already generating enthusiasm and engagement from the very Millenials that the organized Jewish community has yet to engage. Contributors—leading innovators from different sectors of the Jewish community—each use Rabbi Schwarz’s framework as a springboard to set forth their particular vision for the future of their sector of Jewish life and beyond. This book is mandatory reading for anyone excited about the next chapter in the story of an ancient people. 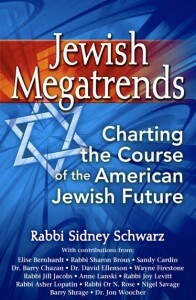 [Jewish Megatrends]… is a compelling overview of the stand-out successes and major challenges in confronting a generation many believe is moving away from its parents’ and grandparents’ ways of identifying Jewishly, and in charting a course for engaging it in ways it can relate to, authentically. Rabbi Schwarz has the credentials for this effort. Besides his rabbinic duties, he is known nationally as a social and political activist, and founder of PANIM, a group he led for two decades that trained teens for leadership through Jewish education, values and social responsibility. He is also the author of two previous books, one exploring the key to successful synagogue models (Finding A Spiritual Home) and the other (Judaism and Justice) on the power of social justice in engaging young people. Those themes form the core of Jewish Megatrends, in which Rabbi Schwarz identifies a growing polarization between what he describes as two types of Jews. One, like himself, he dubs “tribal Jews”; they identify strongly with Israel and worry about external and internal threats to Jewish continuity. The other he terms “covenantal Jews”; they are primarily made up of younger people who are less parochial, less concerned about group solidarity, and more interested in universal themes like justice and human dignity. – Rabbi Elie Kaunfer, Executive Director of Mechon Hadar; Author, Empowered Judaism: What Independent Minyanim Can Teach Us about Building Vibrant Jewish Communities (Jewish Lights). – Arthur Green, Rector, Hebrew College Rabbinical School; Author, EHYEH: A Kabbalah for Tomorrow (Jewish Lights) and Radical Judaism (Yale University Press). – Rabbi Charles Simon, Executive Director, Federation of Jewish Men’s Clubs; Author, Building a Successful Volunteer Culture (Jewish Lights). – Rabbi Avraham (Avi) Weiss, Founder, Yeshivat Chovevei Torah and Yeshivat Maharat; Author, Spiritual Activism. “Sid Schwarz brings together an inspiring cast of prophetic Jewish leaders to provide a tour de force through the transformative shifts taking place in American Jewry today. It is inspiring and empowering to witness such clear thinking and passionate visionaries working to transcend current paradigms and lead us into a bold renaissance in Jewish life. I find this work incredibly helpful for me as I forge my own path as a young Jewish leader, and I would encourage all committed Jewish professionals and lay leaders to absorb and process the vision in this book. “Rabbi Sid Schwarz throws down the gauntlet to Jewish community leaders seeking to engage the next generation in this perceptive book. Bravely, he invites thirteen of the brightest lights in the Jewish community to add their own frontline perspective and experience. The result: a thoughtful road map for the future of the Jewish people in North America based on wisdom, justice, community and purpose. Follow Jewish Megatrends on Facebook.